Advances in technology and policy mandates that require the installation of photovoltaic (PV) solar have contributed to the reduction of system costs. In recent years, both the power and efficiency of solar panels have steadily improved, while the cost of solar panels have dropped dramatically. According to the National Renewable Energy Laboratory, the average cost to install a commercial PV solar system in the United States has decreased from $5.23 per watt (DC) in 2009 to $2.13 per watt (DC) in 2016[i]. 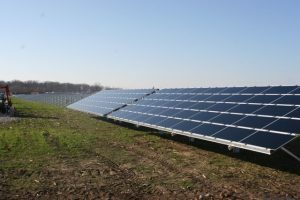 The declining cost of equipment and installation makes installing a solar system enticing for many agricultural producers, and PV panels are an increasingly common sight on farms across Ohio. 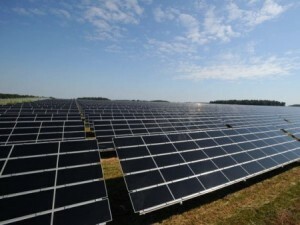 The declining cost of installing a PV solar system is enticing for many agricultural producers. However, while solar may provide an attractive payback on some farms, every farm is unique and evaluating the financial viability of investing in solar requires careful consideration of system design, costs, and modeling assumptions. Plan and prepare – Be curious and careful! Investing in on-farm PV solar requires a significant up-front investment that will involve numerous contracts, spanning decades. It is important to review resources and conduct a detailed project assessment before signing any paperwork. Compare and contrast – Secure three or four project quotes to analyze various proposals and modeling assumptions (e.g., system production, net excess generation, energy escalation, incentives, operations and maintenance costs). Research and review – Understand the equipment and shop around! Just as tractors and agricultural equipment have unique features, not all solar projects are created equal. Investigate your various proposals and identify the key difference between the system design, equipment, and warranties (e.g., type and efficiency of solar panel, string inverters or micro inverters, panel warranty, inverter warranty, installation warranty, ground mount or rooftop design, galvanized or stainless fasteners). Discuss and debate – Review the project proposals with your utility provider and your tax professional to evaluate the project assumptions, contracts, and financial implications and/or benefits. Evaluating the financial investment in solar requires careful consideration of system costs, the value of production, and operation and maintenance costs. Unfortunately, some proposals are hard to understand making it difficult to make fully informed investment decisions. To help simplify the key considerations of evaluating a PV solar project, the University of Wyoming and Ohio State University partnered to develop a bulletin series that clarifies the information and assumptions that are essential to the assessment process. The bulletins listed below, are structured as a six-part series arranged to systematically progress the reader through the project evaluation process. Part 1: Estimating System Production – Site-specific factors such as shading, orientation, tilt, temperature, and panel degradation can influence the amount of electricity produced by a PV solar system. Part 2: Assessing System Cost – A better understanding of direct system costs, indirect capital costs, operations and maintenance, and standard assumptions provides a more accurate financial analysis, fostering informed investment decisions. Part 3: Forecasting the Value of Electricity – To calculate energy savings for a project, one must consider important variables, including the details of the individual rate structure and the assumed energy escalation rate that influence the value of electricity a PV system produces. Part 4: Understanding Incentives – Despite declining costs for PV solar, there are various federal, state, and local incentives which greatly affect the financial viability of a PV installation. 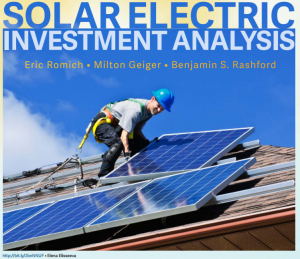 Part 5: Conducting a Financial Analysis – Understanding the solar resource production, system cost, value of electricity, and available incentives enables a robust financial analysis. Accurately evaluating the viability of a solar project requires understanding financial concepts such as simple payback, net present value, and the levelized cost of energy. Part 6: PV Solar Example – The National Renewable Energy Laboratory developed the System Advisory Model (SAM) to help developers, installers, and potential system owners estimate the system production and financial impacts of renewable energy projects. These materials are designed to increase participants’ knowledge of PV solar energy development and the financial considerations to guide informed decision-making with future investments. This six-part bulletin series and additional materials are available for download at: energizeohio.osu.edu/farm-solar-energy-development. Interested in Learning More?….Join Us at Farm Science Review! The 2017 Farm Science Review (FSR) will be held September 19-21 at the Molly Caren Agricultural Center near London, Ohio. Farm Science Review offers visitors the opportunity to learn about the latest agricultural innovations from experts from the College of Food, Agricultural, and Environmental Sciences at The Ohio State University. The Small Farm Center at the Farm Science Review features 27 educational programs suited to smaller farms, with particular emphasis on alternative enterprises, alternative production systems and alternative marketing strategies. If you plan to attend the FSR and are interested in additional information on solar energy in agriculture, please join us for the 50-minute presentation titled, Considerations for Investing in Solar Energy for Your Small Farm on Thursday September 21, at 12:00 p.m. at the Small Farms Center Tent located at the corner of Corn Avenue and Beef Street. For additional information, please click here to review a complete list of educational sessions and demonstrations offered at the 2017 Farm Science Review. [i] Fu, R., Chung, D., Lowder, T., Feldman, D., Ardani, K., and Margolis R. (2016). U.S. Solar Photovoltaic System Cost Benchmark: Q1 2016, National Renewable Energy Laboratory (NREL). Eric Romich is an Assistant Professor & Extension Field Specialist for Energy Development with OSU Extension. More Ohioans are investing in photovoltaic (PV) solar systems to power their homes, businesses, and agricultural operations than ever before. Photovoltaic solar projects certified by the Public Utilities Commission of Ohio (PUCO) increased from 14 in 2009 to 1,834 in January of 2016. Significant cost reductions, favorable energy policy, and the ‘green’ appeal of PV solar systems help explain the growth in popularity, but the growing popularity is also a cause for concern. The growth of PV solar systems installed on residential and commercial buildings presents new safety hazards to system owners and emergency first responders. When exposed to light, a grid-tied PV solar system will generate direct current (DC) electricity that travels through wires and combiner boxes to an inverter that converts the energy to alternating current (AC) electricity. The inability to power-down PV solar panels exposed to sunlight creates potential concerns for emergency first responders looking to extinguish a fire. Simply put, when exposed to light, the panels will generate electricity energizing the system’s DC wiring, causing first responders to proceed as if the building is energized. In response to this safety concern, the 2014 National Electric Code (NEC) developed rapid shutdown standards for PV solar systems on buildings (NEC 2014, Section 690.12). 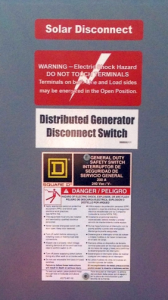 In general terms, the Section 690.12 Rapid Shutdown of PV Systems on Buildings requires that energized conductors (AC or DC) can be de-energized on demand, limiting the energized portion of the conductors to not extend more that 10 feet from the PV array or more than 5 feet within a building. Ohio adopted the 2014 NEC for commercial applications effective January 1, 2015 and residential applications effective February 8, 2016. To learn more, read the fact sheet posted here. Ohio’s largest solar farm as well as other ways to go renewable will be featured during a workshop on Wednesday, November 4 from 9 a.m. to 3 p.m. at Vaughn Industries in Carey, Ohio. Speakers will include renewable energy experts from The Ohio State University and the industry. Anyone interested in renewable energy, such as farmers, homeowners, small-business owners, financial and insurance companies, researchers and students, and state and local agency personnel are invited to attend. For complete information, including session and tour descriptions, speaker bios and registration, read the CFAES news release. Registration is $40 if paid by October 27 ($50 after that date) and includes continental breakfast and lunch. Agricultural producers are constantly looking for ways to reduce their input cost as a means to stabilize production cost. As energy prices fluctuate and the price of PV (photovoltaic) solar energy continues to fall, more and more farmers are investigating the economics of a PV solar system to generate electricity for their farm. Investing in an on-farm solar system can reduce the amount of electricity a consumer purchases from their electric utility provider, minimizing the impact of future price fluctuations. However, each project is different due to variables such as: energy consumption, energy cost, utility provider, rate schedule and tariffs, system design, components, warranties, and contracts. Extension educators have a long history of identifying critical issues facing our clientele and providing factual-based information to guide informed decisions. 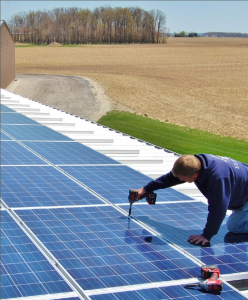 A growing question among many Ohio farmers is, “What is the payback period for a Photovoltaic (PV) solar system on my farm?” Investing in on-farm PV solar typically requires a significant upfront investment that will involve numerous contracts, spanning decades. It is important that anyone considering a PV solar proposal conducts a detailed assessment before signing any paperwork and not fall victim to making a hasty decision. Below are four tips that will help Extension clientele evaluate a PV solar proposal and the associated impacts of the project to their farm. Proposals for PV solar systems frequently involve numerous contracts and are often difficult to understand. If necessary, ask the developer to put the information in a format that you can understand. The cost of the system (equipment and labor) should be easy to identify and not masked by various tax credits, grants and subsidies to the point it is unclear exactly the project cost. Many PV solar system proposals make it appear as if after all of the financial benefits are assumed, a system can be installed for $5,000 to $10,000 to provide all of the energy for a facility. It is important to remember that although there are financial incentives for renewable energy projects, many of them are in the form of tax credits, depreciation, and energy savings not recognized until after the project is operational. In other words, if the project cost is $100,000, then the owner of the project will need to pay the renewable energy developer $100,000 to install the system. What is the factor used to calculate the electricity price escalation? Are competitive grants included in the payback calculation (i.e., a grant that is not guaranteed to be funded)? What inflation rate and discount rate is used? Does the cash flow analysis look at all items on an after-tax basis (e.g., annual electric expense)? Does the analysis include additional cost for insurance? Does the analysis include additional cost operation and maintenance? Does the analysis account for degradation of the panels over time? Similar to other large capital investments, it is a good idea to secure multiple quotes to identify a company that demonstrates experience in PV solar installations and the local electric utility interconnection process. Green Energy Ohio, a non-profit corporation, has lists of Ohio installers. Net metering is a billing arrangement allowing customers that produce their own electricity to receive a credit on their electric utility bills for any extra electricity produced by their system that flows back onto the electric utility’s distribution system, and the credit can be used to offset charges in future months. Interconnecting a PV solar system to the distribution grid may present a number of technical issues and challenges that a system owner should discuss with the utility provider before agreeing to install a system. In addition to the technical challenges, electric bills can be difficult to understand making it hard to evaluate the true impact of a PV solar system on a farmer’s electric bill. 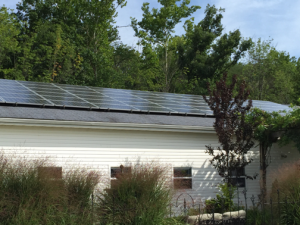 In Ohio, a net metering credit is limited to kilowatt-hour (kWh) charges only and will not reimburse system owners for distribution services, transmission services or demand meter charges. In other words, even if a PV solar system generates all of the electricity for a farm, there may still be additional monthly charges that will remain on the system owner’s electric bill. When estimating the electricity savings in a PV solar proposal, it is important to make sure to identify any charges that will remain on the bill and remove them from the equation. It is a good idea to personally contact the local electric utility provider (not communicate through a third party) to review the PV system proposal with them and understand the impact on the electric bill. A list of utility contacts can be found on the Public Utilities Commission of Ohio (PUCO) website. In 2008 Ohio established alternative portfolio standards that require Ohio’s electric distribution utilities or electric services companies to diversify their electricity generation to include 12½% renewable energy by 2027. Utilities that do not meet the annual benchmarks for renewable generation are subject to compliance payments. However, to comply with the requirement electric distribution utilities or electric services companies can purchase renewable energy credits from other renewable energy producers. Every time a certified renewable energy facility system generates one-megawatt hour of electricity, it also generates one renewable energy credit. A renewable energy credit that is created by solar energy is known as a Solar Renewable Energy Credit (SREC). An electronic database tracks the amount of electricity generated by a solar energy system and the corresponding creation of renewable energy credits. The most common database used to track renewable energy credits in Ohio is the Generation Attribute Tracking System (GATS). There is no assigned value to an SREC, as the prices are influenced by renewable energy policy, supply and demand. For example, in Ohio the GATS solar weighted average price per certificate reached a high price of $471 in 2010 and a low price of $85 in 2015. The sale of SRECs can generate significant income for system owners, which can help offset the high upfront installation cost. There are a number of different ways a system owner can sell their SRECs. For example, the owner of a system may choose to personally manage the sale of their SRECs as they are generated via a web-based exchange program, enter into an agreement to sell their SRECs to an aggregator or broker, or sell their SRECs directly to the system developer who built their system. Some PV solar proposals will try to oversimplify the transaction of SRECs by calling it a discount, rebate, payment, allowance or refund. Regardless of what you call an SREC agreement, the value of these agreements is significant, and the terms can extend for 20 years or more. In addition, the sale of an SREC is a taxable transaction and the sale proceeds will be taxed as ordinary income. If a system owner agrees to receive money upfront for the rights to their SRECs, there will typically be a contract associated with the agreement. The complexity of the agreements can vary significantly and it is essential that you receive a copy of the contract before signing any paperwork. Additional information on renewable energy credits is available here. It requires a significant capital investment to develop a PV Solar system that should undergo a detailed financial analysis. In many cases, project developers will present a farmer with a summary sheet that shows a simple payback calculation for the project. However, using a simple payback calculation to assess the economic feasibility of a PV solar project has major limitations. The simple payback calculation ignores critical investment factors such as the time value of money, variations in energy prices and alternative investment options. In addition, many of the small details and various assumptions discussed in Tip # 1 above should also be included in a detailed financial analysis. On-farm PV solar proposals are wide-ranging, complex, and challenging to evaluate in terms of performance and probability. A good practice is to review the proposal with an accountant or financial advisor who can assist in utilizing multiple financial analysis tools (e.g., net present value, Discounted Cash Flow, Internal Rate of Return) to help accurately forecast the future financial performance of a project. In addition, the National Renewable Energy Laboratory of the U.S. Department of Energy has developed cash flow models to help calculate the levelized cost of energy, net present value, payback period, and other financial metrics related to a renewable energy project. For additional farm-energy resources, please visit go.osu.edu/farmenergy and extension.org/ag_energy. Demonstrate solar energy technology at your next event! Who doesn’t enjoy the warmth of the sun on a brisk fall day? That warming energy is free, so how do we put it to work for us? To demonstrate solar energy technology, a team of OSU Extension professionals has recently designed and built a Mobile Solar Unit. The unit consists of a 140 watt Photovoltaic (PV) solar panel, charge controller, battery back-up system, 2000 watt inverter and safety disconnects. All of the components are built into a four-wheeled cart (about the size of a grocery cart) that can be transported to events throughout Ohio in the back of a pickup truck. 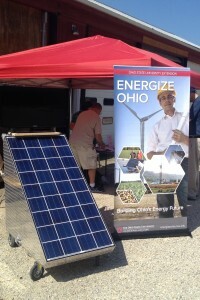 At most any Extension event throughout Ohio, the unit can serve as a teaching tool to demonstrate how PV solar technology works, assist in disseminating renewable energy materials and videos, as well as communicate Extension impacts via short videos. Think about how you might use this demonstration unit at your remote outdoor events, field days, county fairs and 4-H camps where it can power a projector, TV, computer or microphone. As a ready-made charging station for visitors’ cell phones and laptops, the Mobile Solar Unit serves as a great teaching tool at indoor events too. Although the primary goal was to design a teaching tool that could help demonstrate solar technology, this unit also doubles as a promotional resource that will attract an audience to stop and watch short videos of Extension programs taking place throughout the state. In the absence of sunlight, the unit has a battery backup system designed to run a 32” TV (provided with Mobile Solar Unit) for a minimum of 8 hours. To reserve the Mobile Solar Unit for one of your events, please fill out the application form on page 2 of this document and email a copy to romich.2@osu.edu. According to the 2009 USDA On-Farm Renewable Energy Production Survey, it is estimated there are 115 farms in Ohio that have installed an on-site photovoltaic solar system to generate their own electricity. 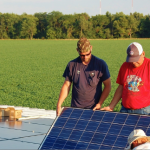 In response to this growing trend, a team of OSU Extension Educators is currently developing new curriculum materials to provide farmers additional information for on-farm solar applications. The Energize Ohio team has recently started work on a short video series, which contains videos related to renewable energy and energy efficiency applications. 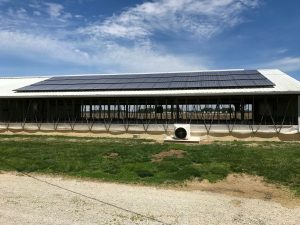 Feel free to preview our first video that reviews a case study of how one farmer has invested in an on-farm solar system to offset a portion of his electricity needs at a swine finishing facility in northwest Ohio. 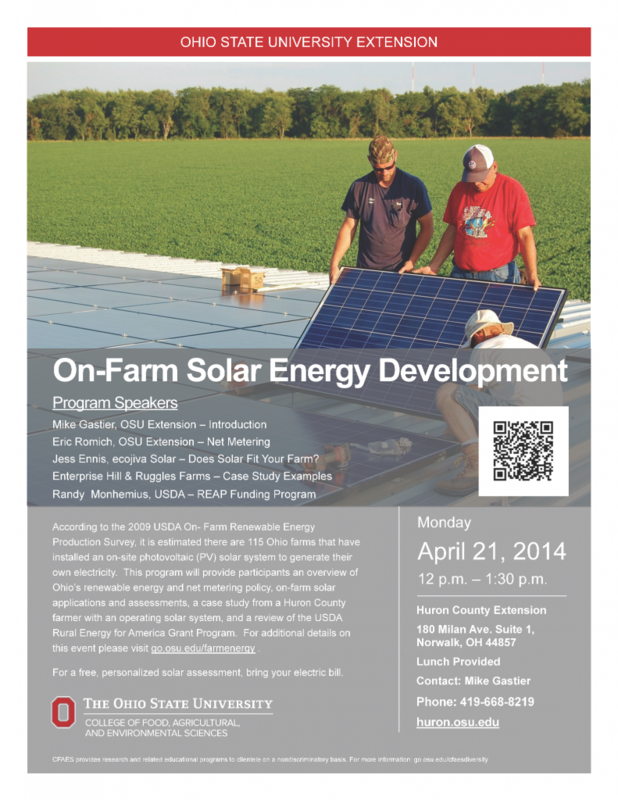 On April 21 an On-Farm Solar Energy program was held at the Huron County Extension Office. Twenty-three local farmers and residents participated in the 90-minute program. Click here to view the program summary, schedule of speakers and evaluation. For additional details on On-Farm Solar Development, visit go.osu.edu/farmenergy. April 21, 2014 / 12 – 1:30 p.m.
Join us for this educational program pertaining to on-site photovoltaic (PV) solar systems used to generate electricity. Discover whether this type of renewable energy will work for your on-farm needs. Refer to the flyer for complete information. For additional details on On-Farm Solar Energy Development, visit go.osu.edu/farmenergy.